The debugger window lets you look at information as it moves through the RPS system. The upper left part displays the time value from each active receiver every time a reading is taken. 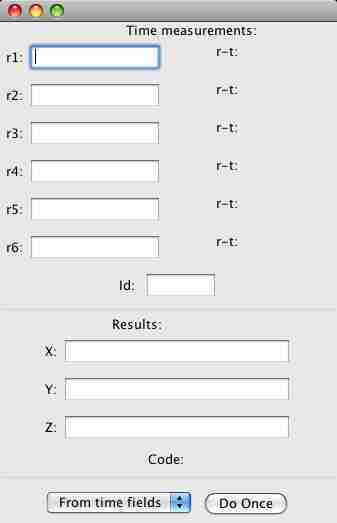 If a position was successfully computed from a set of times, the "residual" value is displayed for each receiver. This is the difference between the measured time and the time that the RPS system expected to measure if the locomotive was really in that position. Typical value are up to about plus or minus 100, corresponding to about a inch in accuracy. If one or two receivers have much larger residual values, there may be a problem with the readings from that receiver with the transmitter in its current location. The bottom section of the window shows the position calculated from each reading. Below the calculated positions is the return code from the calculation. A positive value is considered OK, and a zero or negative value indicates some type of error. It's also possible to type values into the fields and ask the system to process them as if they were inputs. The selection box and button at the bottom are how you do this. The "File" menu includes a "Start CSV Export..." item which can be used to copy the raw input from the RPS system into a file. After you select this, you're presented with a file dialog for selecting the output file name. If you select the name of a file that already exists, it will be removed before output starts. Every RPS input after you select a file name will be written to that file, and the menu choice will change to "Stop CSV Export...". Select that menu choice to stop the logging and ensure that the last lines have been written out.